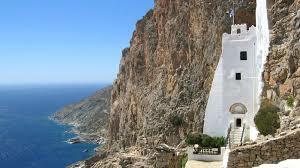 Holiday.gr - AMORGOS, a trip to a myth! Been to AMORGOS ? Share your experiences! 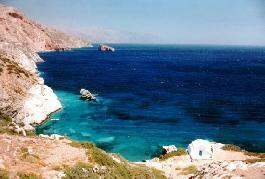 Amorgos is the eastest and 7th in size of Cyclades islands. It is the connection with Dodecanese as it is very close to Astipalea. Its extension reaches 121 sq. km and the length of its shores 112 km. Amorgos' ground is rocky and hilly. The rough beauty of the mountains and the green valleys give the island a unique beauty. Its beaches are the most clean in Aegean Sea. The natural beauty along with Aegean blue southening the hot sand, create a dreamy scenery away from routine. The island has two natural ports. One of them is in Katapoles gulf and the other in Aegiali. Due to the fact that it is across Ion towns (Efessos, Alikarnassos, Militos) made it the first station of Ion tribes that went to Cyclades islands. The remains of three ancient towns, Arsenis, Aegialis and Minoan show the island's history. Like all Cyclades islands suffered a lot from Enetous, Turkish and pirates. Despite all these the island managed to keep its identity and culture. That is something you can see in the architecture of Chora (town), villages and in the way that people live. Friendly and cordial, they welcome you in their island and do their best to make your holidays unforgettable. Amorgos has natural beauties, historic-archaeological interest, religious monuments, options for pleasure and walking routes. That is why it attracts thousands of visitors every year. Still not convinced? Visit Amorgos and enjoy your holidays.